Our Short Breaks allow a disabled young person to have an enjoyable break away from their main carer and give their carer a break from their caring responsibilities. *The number of hours offered may go up or down depending upon levels of funding available, levels of demand and the capacity of the services. Depending on the age of your child you may be eligible for free 15 hours nursery or childminding, which can be used for respite at a children’s centre if your child is aged between 0-2 years. 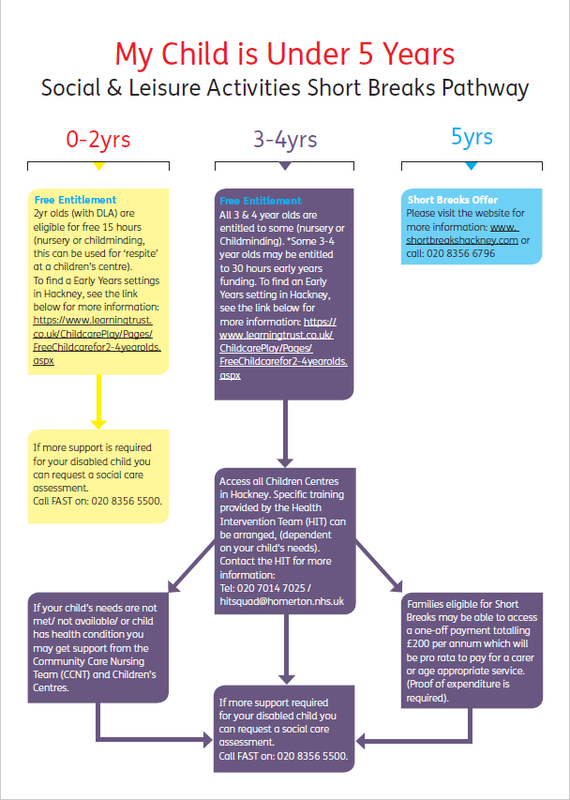 If your child is aged between 3-4 years you will be able to access a range of service provision such as a nursery, children centre or childminding. The expectation is that you follow the pathway to access provision. In exceptional cases where your child is aged 3-4 years you may be able to access a one-off payment totalling £200 per annum to pay for a carer or age appropriate service. If more support is required for your disabled Child, you can request a Social Care Assessment via Hackney FAST on: 020 8356 5500. Short Breaks are activities for children and young people with physical, health or learning disabilities. The offer provides free access to a range of school holiday, after-school and weekend services as well as the option of an Individual Budget Pre paid card. Please complete our application form SB_Application_Form_New_Update and return it to us at: short.breaks@hackney.gov.uk or Hackney Learning Trust, 1 Reading Lane E8 1GQ. Please provide an original copy of your child’s Disability Living Allowance at the Middle to High Rate or Personal Independence Payment at Intermediate or Advanced. The Short Breaks hit squad is a team of health professionals who work with activity providers to help children access and enjoy their chosen short break. We work with mainstream activities and with activities particularly geared to those with special needs. We accept referrals from parents, professionals and activity providers.